In this tutorial we’ll explore the use timers in LPC2148 ARM7 Microcontroller. In general, timer means exactly how it sounds. Timer and counter is very important feature which allows us to provide time variable to our microcontroller based project. Most microcontrollers comes with built-in timer peripheral. The LPC2148 has two functionally identical general purpose timers: Timer0 and Timer1. These both timers are 32-bit along with 32-bit prescaler. Timer allows us to generate precise time delay. For Example: In our blink LED example project, we’ve generated random delay of approximate 1 Sec. but using Timers we can generate accurate time delay. We’ll get into that while discussing example project of Timer. Apart from this we can use timers as pulse width modulator and also as free running timer. Timers in LPC2148 ARM7 Microcontroller enable us to do really cool stuffs. Also timer enhances the use of microcontroller in many different ways. We may need to dedicate one more post to understand Match and Capture registers and its uses in real world application. Let’s first understand free running counter and related fundamentals. How Timers in LPC2148 ARM7 Microcontroller Works? The heart of timers of the LPC2148 Microcontroller is a 32-bit free running counter, which is designed to count cycles of the Peripheral Clock (PCLK) or an external clock, this counter is programmable with 32-bit prescaler. The tick rate of the Timer Counter (TC) is controlled by the 32-bit number written in the Prescaler Register (PR) in the following way. There is a Prescale Counter (PC) which increments on each tick of the PCLK. When it reaches the value in the prescaler register, the timer count is incremented and the Prescaler Counter (PC) is reset, on the next PCLK. This cause the timer counters to increment on every PCLK when PR=0, every 2 PCLKs when PR=1, etc. EXAMPLE PROJECT: In this example project we’ll generate precise 1 Sec. of delay using Timer0. The Timer uses PCLK (Peripheral Clock) as a clock source. 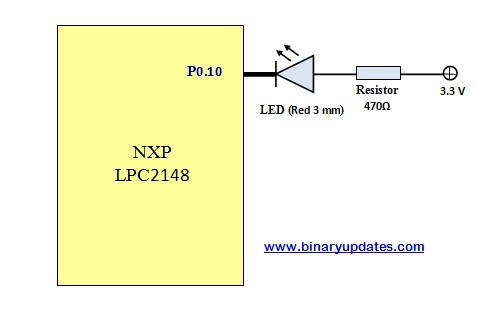 From previous post we’ve seen how to set up PLL in LPC2148 ARM7. The Peripheral Clock (PCLK) has to be initialized before using Timer. Here in this example: we have used 12 MHz external clock to be tick at 60 MHz. Hence the delay required for TC to increment by 1 will be 1 ms. while(! (PLL0STAT & 0x00000400)); //is locked? We believe that you’re following these tutorial series in a sequence. Here we’ll discuss only about some functions which deals with setup and configuration of Timer0. First few lines are self explanatory & well commented in code itself. In this function we’ll setup and initialize Timer0. Also we have to select Timer Mode then setup prescale value in Prescale Register (T0PR) to 59999. The prescale value defines resolution of Timer0. In this case, at 6000 clock cycles at 60 MHz. We’ll get 1 ms resolution. Then simply reset Timer0.